North Wilkesboro Shop Goes High Fashion in Accessories! Hobo International has been designing for women, since 1990. We are excited to now have Hogo International wallets and handbags in our North Wilkesboro shop. Hobo combines innovative, quality materials in real designs to meet the demands of life. All Hobo products have unique details such as organizational pockets, security zippers, sturdy straps, functional spaces and lightweight materials --features that make Hobo products distinctive and versatile. 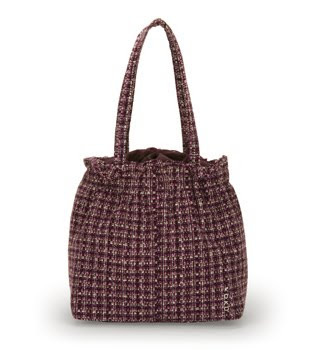 Confident styling, edgy attitude, quality construction and practical features are the hallmarks of Hobo designs. Hobo Lauren is in the Hobo Vintage Collection. 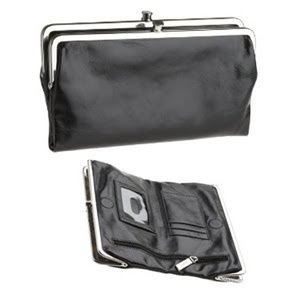 Lauren clutch purse is versatile and can serve as a Hobo wallet or a stand alone Hobo clutch purse. Features: Magnetic closure. Multiple zipper closures and pockets. Credit card compartment. Fully lined in fabric.Dimensions: 8.5 x 5.25 x 2. What can we say...we are now selling a BIG designer line in the fashion industry! Am I Ever Really Going To Exercise? As many of you know I am trying really hard to change my eating habits and move towards a more healthy lifestyle, however I cannot seem to embrace exercise! So I am going to make myself accountable to the tips below and to you! 1. I should be aware of why I should exercise. There needs to be a good reason to do it! 2. I am going to make a personal "reasons list." A couple of my reasons-more energy, not to be breathless climbing stairs, and look good in my clothing. 3. Exercise with a friend, so I be accountable. 4. I am going to try to exercise first thing in the morning. (I'm not sure about this one, but I am going to try to do at least half in the morning and work towards each morning. People who exercise 6 to 7 days per week first thing in the morning are much more successful at exercising! 5. Reward myself! I need to think about this one. What about $2.00 in a piggy bank each time I exercise and each month get myself a new piece of clothing! 6. Keep a log of my exercise. I will write down my exercise minutes each day. Set some big goals to walk a mile quicker etc. 7. Make my exercise enjoyable! For example, listen to great music on my Ipod. I will update you from time to time with the honest truth, so my blog friends are going to help make me accountable. In the retail world, I realize that packaging sells, unfortunately kids' lunch options may look great, but are not always nutritious. Solve this problem by packing your children's lunches in fun containers, with fun party napkins and stickers for the plastic bags. Make a healthy lunch fun to eat and a nice loving surprise each day! Pinwheel Sandwiches: Put your child's favorite sandwich filling (for example-ham & cream cheese or PB & J), roll it up, slice it into smaller pieces. I like to roll it up and put it in the frig overnight for easiler slicing. Fun Chips: Use large cookie cutters to cut flour torillas or wraps into fun spaces. Place on a cookie sheet and bake in the oven at 400 degrees for 7 to 8 minutes. Send them with their favorite dip. Another hint is to brush a small amount of olive oil or Pam spray and sprinkle with parmesan cheese or cinnamon sugar. Cookie Dippers: Vanilla wafer cookies are great to dip in your children's yogurt. Animal crackers are great too! 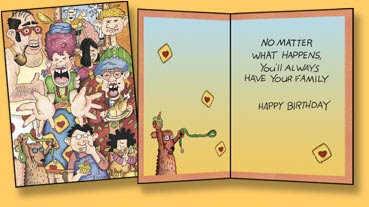 Oatmeal Studios-Elkin Shop's Laugh Til Ya Cry Cards! Caution! 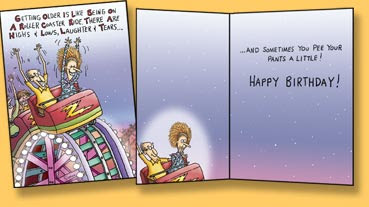 When reading these cards we recommend wearing Depends! We cannot highlight the North Wilkesboro funny cards and not share the great finds in our Elkin shop as well! Oatmeal Studios features colorful artwork on the inside and out. These have great girlfriend to girlfriend funnies as well as "bust a gut laughing" guy cards (I say gut for the guys, because we girls just have cute tummies)! New Cards at our N. Wilkesboro Shop! Laugh Til Ya Cry Funny! These are an "off the wall" kind of card. but are still in good taste! We just received this complete display of bows, at both Elkin and N. Wilkesboro locations, which allows you to mix and match the center of each bow. This is one of my favorite new items! I have seen lot of different products as I shop for the shops and this one stopped me in my tracks! 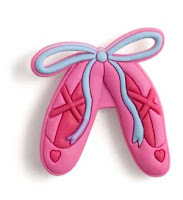 You purchase a bow and then can buy several different designs to add to it by simply removing the center bow knot and snapping in ballet shoes (in this case)! Every kid in Surry and Wilkes Counties needs a smencil to go back to school and yes, they really do smell great! Sheets of newspaper are tightly rolled around the #2 graphite writing cores. Then they're hardened - allowing them to be sharpened just like wood pencils. Next, they are soaked with a gourmet liquid scent (made by an award winning fragrance company). Once they're dry, an eraser is attached and they are each one placed into a corn-based biodegradable Freshness Tube. Now available at both shops! We Are Loving All Our New Lunch Bags! Yes, we are again blogging about lunch bags. 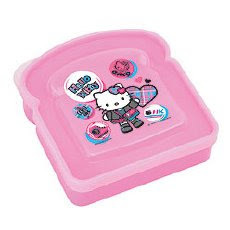 Remember our bling ones? Now we just received another lunch bag shipment for the fashion trendy female with our lunch bags available in four different designs in a variety of colors. Many of us are taking our lunch to work to save money, but why in the world would we use a brown paper bag when we can carry this stylist bag for around twenty bucks! Big Shipment of Readers in Today at Both Shops! For our Elkin customers: Yes, we are listening to you and we now have a huge display of all types of readers in our Elkin shop! Now a Note for Everyone: Yes, we have restocked our readers and have added a great selection of sunreaders also. If you like bright colors or bling on your readers (not the boring drug store kind) then stop by-because we have bling and lots of great color patterns from mild to wild! One of our best new items ever: When you discover you need to wear readers, then you realize that you need them all the time! So we have a great new magnetic hook, so you never lost them again and keep them close at hand. 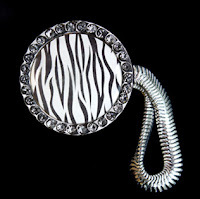 This trendy little magnet also holds your pen or id and is available different designs including a silver heart, butterfly, cross, leopard and a pink crown. We even have one for men! I mean the floor literally with our additions of two different mat and rug lines. 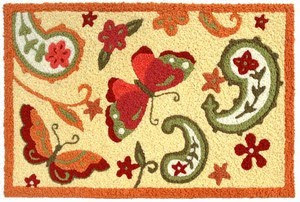 Jellybean accent rugs are machine-washable 3'x2' rugs that are perfect as a welcome mat at the front door, in front of a kitchen or bathroom sink and in a sunroom. We have designs in florals, leopard, zebra, bears, veggies, rooster, and many more. MatMates which coordinate with our magnetic mailbox covers and many of our flags have just arrived in fall and winter designs. We sold these mats in our Elkin Shop this Spring and they flew out right away, so we decided to add them to both shops. You can purchase the mat separately or use it with our decorative rubber tray. After your first mat and you see how great they wear, you will want to start a seasonal collection. 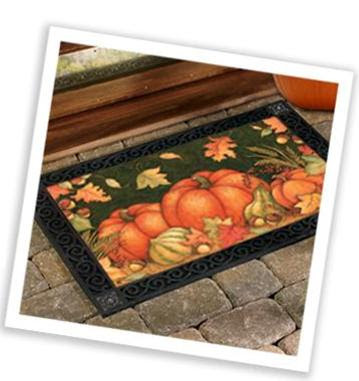 We have sold our mailbox covers and flags for years and plan on keeping these mats in stock to coordinate. A Piece of Cake Anyone? No! It's not real food, rather these little desserts are ERASERS (each sold individually)! These environmentally friendly, recyclable erasers from Japan are taking the world by storm! We just received our shipment in N. Wilkesboro and they are on their way to Elkin. You can even take apart most of these Japanese erasers and put them back together again and again, just like a little puzzle. Don't like cake, then we have hamburgers, ice cream, panda bears, birds, and sports stuff! Kids are going crazy over these and they are small and easy to carry around. Collect them all! 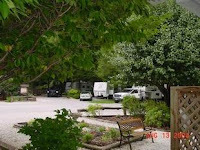 Mackenzie and I are camping with my parents (and our new hedgehog, Thistle) near Marion, NC at the Mountain Stream RV Park. 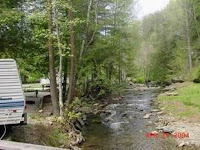 Honestly, this is a very nice park with great landscaping, beautiful stream, fishing, and a great Saturday covered dinner. I have posted a couple of pictures, so you can get the idea. I cannot post this without the mention that I caught 3 of the 4 trout we ate for dinner on the grille! We are either headed to Black Mountion or Burnsville in morning for the afternoon. I will post a few photos, if we find any jewels tomorrow! Saturday, August 8th, is the last day for NC's tax-free weekend for school supplies. book bags, totes, and pencil cases, Rainbow Sandals, Vera Bradley stationery, Hello Kitty school supplies, Melissa and Doug art supplies, and lunch bags. Hope I have not forgotten anything! Microfiber Espresso Is Back! Patchwork Bag Has New Look! 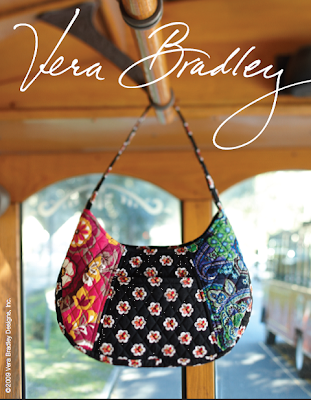 Stop by because as always our Vera Bradley Special Collections are limited in the time we can reorder! Be sure to get the style you love! 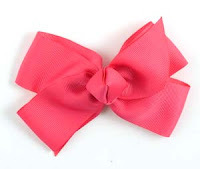 Microfiber has a lot of trendy shapes this season and a great version of the hipster. It also a super surprise interior fabric. I will leave that info a secret. The new Patchwork Bag also has two great accessories pieces. The design also makes it very easy to pick a wallet to match. 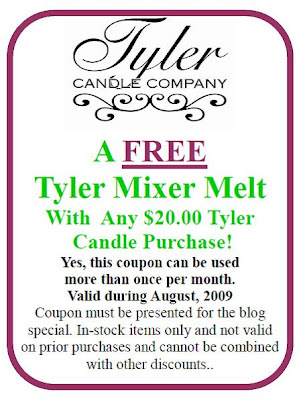 August Coupon as a Thank You for Following Us! Thank you again for following along with our blog! Please print the above image and bring it in the shop. You are welcome to right clip on the coupon and save it to a Word document to save ink and for ease of printing. Lifesighs Cards-A Lost Treasure Within the Shops! 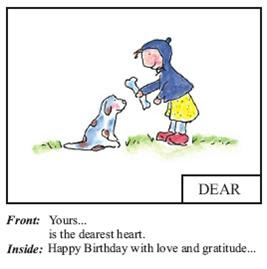 There are no other word to describe Lifesighs Greeting Cards other than sweet! This is one item that many customers can walk around the shop on multiple trips in and never see its value for $1.75 retail card with a special heart tug in each endearing card! If you are like me I don't want to go into a big store like SWMart for small purchase like a card the hop in and see us instead. Need Extra Cash? How About a Yardsale? Don't let the summer pass you by without cleaning out those closets and going through the basement-there is hidden cash all over your house! Here are a few points to maximize your profits! 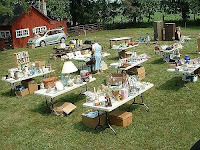 6 Tips to the Perfect Money-Making Yard Sale! 1. Advertise your yard sale with a small newspaper ad and road signs. People have to find you to buy your stuff. 2. Price every thing because people will not ask. 3. Display like items together just like a supermarket. 4. Hang all the clothes on hangers. 5. Don’t price to high. Go about 10% more than you think it is worth, so you can offer a discount. 6. Be friendly. Offer grocery bags for shoppers to take their purchases. You could also make a little extra money selling drinks and snacks. Many yard sale shoppers are spending their whole day going from sale to sale and would appreciate a snack and a smile! New Lunch Bags with Bling Arrive Today! 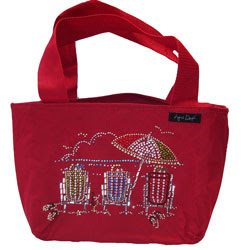 Like many of you, I am packing my lunch every day trying to eat healthier and save a little money, but I don't like to carry a plain lunch bag-so we have just gotten the lunch bag with BLING designed by Lynn Dorf (available at both shops). We have many designs including Fight like a Girl with a pink ribbon, a motorcycle for you biker babes, and a cool heart peace sign. Combine first 8 ingredients (mushrooms through garlic) in a small bowl; toss gently. Let stand 30 minutes, tossing occasionally. (Note: I go ahead and put this into a separate bowl to marinate on the way to work & then add it to my subroll at lunch and eat the leftovers as a salad). Cut a thin slice off top of the roll and set aside. Cut a 2-inch wide, V-shaped wedge down length out of the roll. Drain vegetable mixture. Line the roll with a lettuce leaf; arrange ham and turkey evenly over lettuce. Spoon vegetable mixture evenly over meat and cover with roll top and this makes a favorful take-to-work lunch! 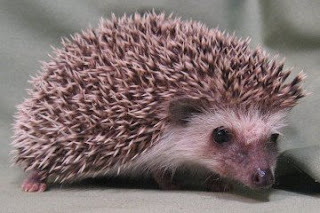 This is a photo of our actual hedgehog, Thistle. We are picking her up today at the Dream Meadow Flowers Farm in Shelby, NC.